The 34th edition of the Montreal World Film Festival kicked off its celebrations last evening with a world premiere screening of local director Louis Belanger's ROUTE 132. Films from across the European continent dominate the Festival's main competition section....all in contention for Grand Prix des Ameriques, the Festival's highest honor. France is the country with the most films in the section, not surprising considering the Festival's love of French cinema and cinema stars. 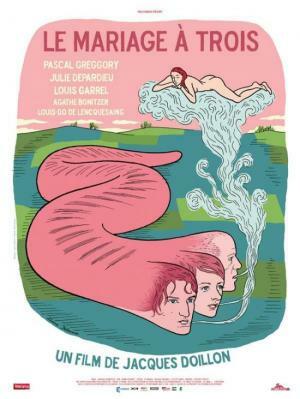 Leading the pack of the French entires is THREE-WAY WEDDING (Le Mariage A Trois), a romantic fare directed by Jacques Doillon and starring Pascal Greggory, Julie Depardieu and Louis Garrel. Other prominent French titles competing for the Festivals top prize include NANNERL, MOZART'S SISTER by René Féret, which views the Mozart family from a different angle; the urban drama TETE DE TURC by Dominique Elbé about a teenager trapped in the violence of the suburbs; MEETING WITH AN ANGEL by Sophie de Daruvar and Yves Thomas, deals with a couple, Isabelle Carré and Sergi Lopez, whose sado-masochistic relationship is turned on its ear in a surprising turn of events; and LOST HERITAGE by Christian Lara is a French-Gabon co-production, that focuses on a farmer who must marry by the end of the month in order to claim an inheritance. In OXYGEN, a Belgian-Dutch co-production directed by Hans Van Nuffel, two brothers must face the reality of a terminal illness, but they do so in totally different ways. In LIMBO, a Norway/Sweden/Denmark/Trinidad & Tobago co-production, debut director Maria Sødahl tells the tale of a young family in the 1970s who leave their native Norway to set up in a tropical paradise where servants take care of house and children, while the housewives gather poolside for gin and tonics… and resemble nothing so much as ticking social time bombs. In VENICE by Polish director Jakub Kolski, 11-year-old Marek is obssessed by the Italian city, a place his family has gone to visit for generations. Now, in the summer of 1939, it is his turn to go. But war with Germany looms and while his father goes off to the army, he and his mother end up in his aunt’s country villa. TRUCE by Russian director Svetlana Proskurina is set in a god-forsaken place that can’t be found on most maps. However, the film's protagnist is headed there (his hometow) where he wants to live, love and maybe find a wife. What he finds is much more than he bargained for. This intoxicating mix of European titles shows the continued vitality and diversity that is European cinema. Montreal celebrates its European roots with a series of diverting and distinguished films from the continent. The calendar may still say August, but the busy Fall film festival season kicks off in earnest in Montreal later this week as the Montreal World Film Festival (MWFF) will celebrate its 34th edition. The Festival, one of the only FIAPF A-Class film festivals in North America, is the first in a marathon that will take film buffs and professionals to film events in Toronto, Venice, San Sebastian, New York, Woodstock, Deauville and Chicago (just to name a prominent few). The MWFF, still helmed by the controversial Serge Losique, is a bastion of international arthouse cinema, with a special emphasis on French language pics and homegrown Quebec talents. Appropriately, festivities kick off on Thursday evening, August 26, with the world premiere of ROUTE 132, directed by local filmmaker Louis Bélanger. As one of the key outposts of French culture in North America, the city is obviously a little French film crazy, and this is evidenced by the strong representation at the Festival of Gallic films and personalities, as well as strong French language titles from Belgium, Switzerland, Quebec and Africa. In a bookend that accentuates the "francophone" nature of the event, the Closing Night Film on Labor Day Monday, September 6 is the International Premiere of THE PRINCESS OF MONTPESIER by the iconic French director Bertrand Tavernier. The film, set in 16th century France, is an epic re-telling of the Protestant/Catholic conflicts. The film stars Lambert Wilson, Mélanie Thierry, Grégoire Leprince-Ringuet, Gaspard Ulliel and Raphaël Personnaz. French film stars are "de rigeur" in Montreal, so the crowds will obviously be stoked by the presence of such superstars as Gerard Depardieu, who will offer a master class on acting, and Nathalie Baye, who will receive a Lifetime Achievement Award and a mini-retrospective of her most important films over a career that now spans over three decades. French films are prominent in all the sections of this year's Festival. France is well represented in the main Competition Section, with such buzz titles as THREE-WAY WEDDING (director Jacques Doillon), starring Pascal Greggory, Julie Depardieu and Louis Garrel; NANNERI, MOZART'S SISTER (Rene Ferret), which views the Mozart family from an unsual angle; TETE DE TURC (Pascal Elbé), about a young teenager trapped in the violence of the suburbs; MEETING WITH AN ANGEL (Sophie de Daruvar and Yves Thomas) with actors Isabelle Carré and Sergi Lopez starring as a couple whose dominanant/submissive relationship is turned on its head; and the French-Gabon co-production LOST HERITAGE by Christian Lara. The Competition also includes prominent films from Europe, Asia and the United States.....of which will be written in the coming days. Visit this blog site often for updates or log on to the Festival's own website: www.ffm-montreal.org. The excitement is building as Montreal begins its annual love affair with international cinema. 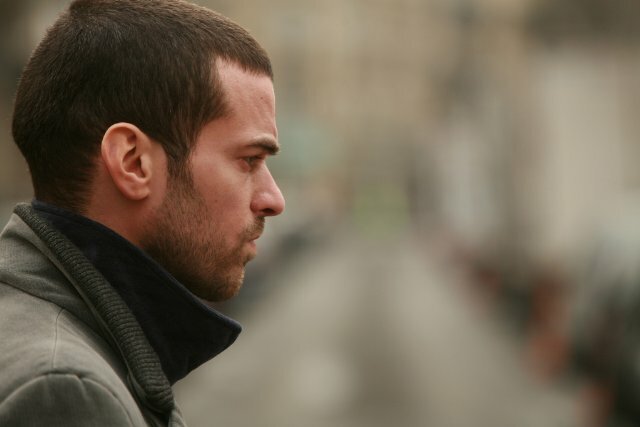 French bad boy actor Romain Duris will be feted on screen for three Wednesdays starting tonight, as the BAMcinematek, one of New York's most adventurous arthouse cinemas, explores the work of one of Europe’s most popular young actors. Already a major star in his native France, Duris is building on that status in America with the upcoming stateside release of his newest hit, Pascal Chaumeil’s romantic comedy, HEARTBREAKER. The series began this evening with the strong drama THE BEAT THAT MY HEART SKIPPED (2005), which brought the young actor international recognition. The film won a top prize at the Berlin Film Festival and the young actor was nominated for his first Cesar Award as Best Actor. Born in Paris in 1974, Romain Duris was a struggling actor until a casting director discovered him on the street and cast him in his debut in director Cédric Klapisch’s LE PERIL JEUNE (1994), which screens on September 8. Two years later, Duris reteamed with Klapisch for the slice-of-life comedy WHEN THE CAT'S AWAY (1996), a well-received French sleeper hit (which also screens on September 8). Over the next decade, Duris built a solid résumé in films like Roman Coppola’s CQ, Merchant-Ivory’s LE DIVORCE, Tony Gatliff’s GADJO DILO and Klapisch’s L’AUBERGE ESPANOLE, which was a major international hit. Duris paired with fellow French film star Louis Garrel in DANS PARIS (2006), Christophe Honoré’s stylish drama about two brothers, that screens on September 1. This intoxicating mix of French New Wave mix and the stories of American novelist J.D. Salinger, is not as well known in the United States as it should be. Hard as it is to believe, the summer of 2010 (the hottest on record.....thank you global warming) is coming to an end. The cranking of the film industry's engines begin in earnest in September with the Venice,, Montreal, Toronto, New York and San Sebastian film festivals.....but for the last two weeks of summer, we still can relax with the languid and liquid films of French filmmaker Eric Rohmer. 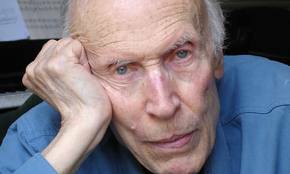 When Eric Rohmer died in January of this year at the age of 89, he left behind a truly unique body of work that had put both film critics and film buffs under his spell for more than half a century. While he cut his teeth during the famed French New Wave, he always stood apart from the wily experimentation of his fellow travelers Godard and Truffaut. In many ways, his influences were more literary than visual and his films found fascination in the simple act of observing, of talking, of being in the moment. The camera often did not move and the actors were almost frozen in their stances, but the voyeurist impulse (which is at the heart of cinema) made such encounters truly fascinating and memorable. What seemed remarkably simple in style was in fact deceptively deep.....a chronicle of human foibles and human inspiration. In celebration of his extraordinary career, the Film Center is offering the most complete North American retrospective of Rohmer’s work in more than a decade, including all of his feature films, the U.S. premiere of his 1980 TV film CATHERINE DE HEILBRONN, plus special in-person appearances by key Rohmer collaborators and admiring critics. All of the goodies are here, including his celebrated Six Moral Tales (including the delicious CLAIRE'S KNEE and MY NIGHT AT MAUD'S), Comedies and Proverbs (including such treats as PAULINE AT THE BEACH and FULL MOON IN PARIS)and the late period The Tales of The Four Seasons. Over the course of nearly 25 films, Rohmer explored the shifting dynamics of desire and dialogue, offering the most potent exploration of the laws of attraction and revulsion in what is comically called "the war between the sexes". Aside from the Rohmer oeuvre, there will be a rare screening of the 1994 documentary ERIC ROHMER: Preuves à l’appui by André S. Labarthe and Jean Douchet, which offers a rare peek behind the curtain of at the master’s creative process, providing access to the notoriously private director as he talks about his life, his work and his muse. From his 1959 debut film THE SIGN OF LEO through his final film TRIPLE AGENT in 2004, Rohmer explored the delicate vibration of human emotion and the conflict between the mind and the heart in ways that remain universal and timeless. To misquote that other great existential lyricist William Shakespeare: get thee to the Walter Reade Theater......beauty awaits and it is fully air conditioned to boot. Even if you don't know his name, you probably know his imagery. The streetwise graffiti, the charismatic iconography, the madcap use of words and visuals from pop culture.....the coolness of the work and the indelible signature of a gifted, natural (as opposed to heavily trained) artist. And add one more romantic detail.....death at the tender age of 27 after a blazing career that now sees his doodlings capturing record prices on the art auction market. Like James Dean before him, he is forever enshrined as a young man of his age who never endured growing old. Jean-Michel Basquiat, the Brooklyn-born "street artist" whose five years of fame in the 1980s has secured his position in the top ranks of art history, is the subject of a superb new documentary JEAN-MICHEL BASQUIAT: THE RADIANT CHILD, directed by his longtime friend Tamra Davis (DOWN AND OUT IN BEVERLY HILLS) and produced by France's Pretty Pictures (www.prettypictures.fr), which also has international rights to the film. The film's core is a previously unseen series of interviews that Davis shot of her artist friend in candid closeups in Los Angeles in 1985. Less than two years later, Basquiat was dead....a victim of drinking, drugs and the hype and demands of an artist whose meteroic rise was as dramatic as his sudden and precipitous fall. Basquiat's story has been told several times before—in Glenn O'Brien's loosely crafted 1981 fiction film Downtown 81 (aka New York Beat) about a downtown artist struggling to pay the bills; and most notably in Julian Schnabel's 1996 film Basquiat, with Jeffrey Wright's spot-on performance in the lead and a who's who of indie stars playing such art icons as artist Andy Warhol (played in the film by David Bowie) and gallerista Mary Boone (Parker Posey). 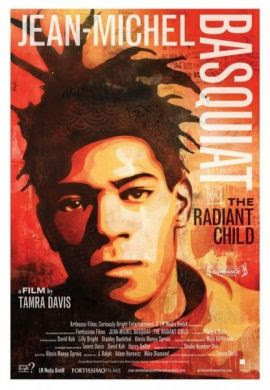 The title of this latest film comes from a celebrated article on Basquiat in the New York Times, where the moniker of the "radiant child" first was uttered and which provided an errily prophetic description of both his personal and artistic appeal. Beginning and ending with the Langston Hughes poem "Genius Child" ("Nobody loves a genius child"), the film offers an image of Basquiat as perpetually misunderstood, under appreciated, and tormented. Did this stem from his "outsider" status as a street artist who graduated to the big leagues of the art world, or what was the contribution of continuing racism that bedeviled a black artist in a predominately white scene? Did the mainstream art press and industry's categorization of him as a typecast "black artist" cut to the core of his moodiness and depression? Basquiat, in his own words for a change instead of the solicitous exclamations of those who got rich from his artwork, offers a fascinating look at his influences, particularly the dual inspirations of music (bebop jazz and hiphop, in particular) and literature (beat poetry especially). Although he was certainly not the first artist to do so, Basquiat used visual iconography and words and phrases as signals in his work, mixing the literal, the figurative and the philosophical in works of astonishing visual dexterity. The film offers many scenes of the artist working on his canvases and full-on explorations of the finished works (with accolades from leading art critics and gallery honchos accompanying the diverting slide show). While much of what is said is praiseworthy, the director has included commentary from close friends and former lovers that illustrate the man's darker side, including his heroin habit, his often violent behavior, his obsessive desire to please his father and his ambivalence about his own ambition and superstar success. As a beacon of the downtown art and music scenes that flourished in the SoHo and East Village neighborhoods in downtown Manhattan in the 1970s/1980s, the film illustrates the intoxicating excitement and freedom of the bohemian scene before the area (and the art world) became so gentrified and money conscious. As a snapshot of a bygone era when lofts were occupied by artists rather than bankers and lawyers and freedom and sexual experimentation were the life blood of urban living, the film is a moving testament to a time and place that no longer exist (or at least have moved to Brooklyn and other outer borough nabes). For those familiar with the art scene of those years (and I count myself among them), there are some glaring omissions in the narrative. While Basquiat's fetishistic alliance with pop king Andy Warhol is exhaustively presented, there is no mention of Basquiat's equally prestigious colaboration with Italian artist Francesco Clemente (who at the time was more influential than the past-his-peak Warhol). Another strange misstep is not including any mention of Mary Boone, the leading SoHo gallerista of her time, who did much to elevate Basquiat's reputation with her high paying clientele. While the film does include the other art world personalities that are central to the story (including gallerist Anina Nosei and power broker Larry Gagosian), one can only assume that Ms. Boone herself did not agree to be included in the final film or was so burned by her involvement with the moody artist that she conveniently air brushed him out of her professional trajectory. While the finished film, with its terrific soundtrack, editing style and forever forward motion, certainly illuminates what made Basquiat so special (and so tragic), one can only speculate that there was more to the story of this "radiant child" than appears in the film's slim 90 minutes. However, for those hungry to learn more about those rollicking years when rents were cheap and art was produced on almost every corner, the film is a worthy document and testimonial to a time, a city and a great talent whose life was lived on a short but brilliant fuse. 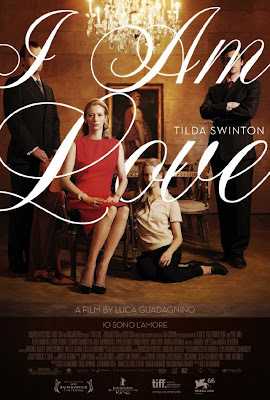 The film, currently in theatrical release in the United States via specialty distributor Arthouse Films (www.arthousefilmsonline.com), will certainly be one of the documentary success stories of the year and a major contender for end-of-year awards and critics prizes. For devotees of French cinema, it doesn't get much better than this. Gérard Depardieu, the bad boy-turned-eminence grise of French cinema, will give a master class on the cinema at the Montreal World Film Festival on the Festival's final day of September 6. The celebrated French star will reflect on his craft, his experiences with the great film directors of his era and on his vision of the contemporary cinema. 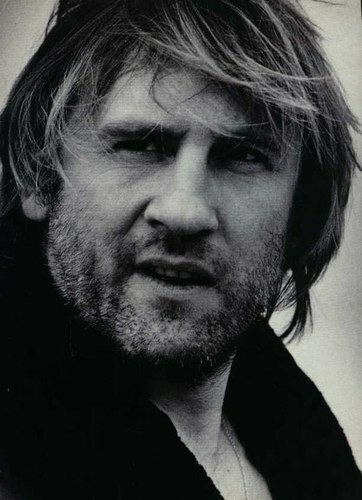 Depardieu’s perspective on the "seventh art" includes his acting for a who’s-who of contemporary cineastes from around the world, including such iconic directors as Claude Berri, Bernardo Bertolucci, Bertrand Blier, Claude Chabrol, Marguerite Duras, Marco Ferreri, Jean-Luc Godard, Peter Handke, Claude Miller, Maurice Pialat, Alain Resnais, Barbet Schroeder, Ridley Scott, Daniel Schmid, François Truffaut, Andrzej Wajda and Peter Weir. The actor has clocked nearly sixty films in a career that now spans four decades.